An efficient tool for clearing sidewalks, driveways, and patios, the Toro 2-speed electric blower has a low speed of 130 mph and a maximum speed of 160 mph. That’s more than sufficient power to blow away most leaves and debris. At only 4.6 pounds, it’s also incredibly easy to wield. The power controls are located on the handle at easy finger reach. The only hassle is having to drag around a power cord, but even that’s not a big deal. 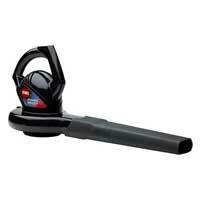 For only $34.97, this Toro blower has ample power to do most yard cleaning tasks.